Holiday Gift Ideas: Can’t find your Keys? Get the KeyRinger! I’ve been thinking about how to locate various things, specifically, my luggage when I travel, especially when cruising. If you’ve ever taken a cruise, you know that they give you a tag color such as red and then you have to go to the ‘red’ section and hunt through hundreds of bags to find yours. I wanted something that I could attach to my bags that would make a loud noise so I could find them. I also wanted something I could put on my car so that when I lost it in the parking lot, I could push a button and it would make a loud noise so I could find it. And of course, there are many other things I lose and could use help finding such as my keys, my purse/wallet, etc. But there isn’t really any devices specifically for locating luggage so I thought that a key finder/locator would work to put in the outside pocket or on the handle. That sounded like a great idea, but all of the key finder devices I could find had really poor reviews and/or were very expensive and many of them worked like “The Clapper” where you made a noise and they supposedly responded. But I guess in most cases, they either don’t respond at all, or they go off with every little noise. It has a flashing light and loud sound (~106 db) to help you find your missing item. The two 2032 lithium batteries last approx. 12 months and can be replaced at most hardware or electronics stores (or online through their website). It weighs 3/4 ounce. It can locate the other device up to 300 feet and is supposedly durable enough to withstand being run over by a standard-size car. Here is the KeyRinger FAQ page. The KeyRinger is $29.99 for 2 units plus $4.95 S&H. You can order it here. Interestingly enough, I also discovered another use for this. In this thread from RC Hangout (for Remote Controlled Airplanes), they were discussing how to find a downed plane and one person attached the KeyRinger to their plane. It is amazing how many things you may need to locate. The Loc8tor Plus is the ultimate tool that will help you keep tabs on your children, pets and possessions and is ideal for use at home, out and about or for business. The Loc8tor Plus has two main functions; Locate and Alert mode. Locate mode – Is for Finding. To find an item, simply select from a drop down list on your handheld which tag you want to locate. Directional audio and visual cues from the handheld will guide you to the exact location of the missing tag. It will literally take you minutes (even seconds) to find things that would normally have you hunting around for hours and maybe never found at all. With amazing accuracy you will be guided to within an inch/2.5cm whether you are indoors or out, in complete darkness or in a noisy room. To find your item turn around in a full circle then walk in the direction the handheld indicates has the strongest signal – It’s as easy as that!!! Alert mode – Helps stop things getting lost. Enables an invisible boundary to be set around the Loc8tor (you) and warns the moment any tagged item goes out of your preset safety zone (Alert Alarm) with a vibration alert, audio alarm and handheld display showing which item/s wandered off or has been stolen. Select from three present safety zones – near, medium or far each of which can be further fine tuned to help define the distance required. 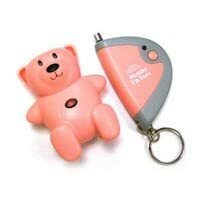 The Panic Tag (when used in Alert mode) contains a Panic button enabling a child or dependant to call for help. When pressed it activates an Alert Alarm on the handheld advising which child activated the Alarm. This is ideal as a personal alarm for a child or dependent and can be used on a beach, in a park or shopping centre to name but a few. The regular Loc8tor pack is $99.99 plus S&H. It only has the locate mode, not the alert mode (as described above). I’m sure these are very good too, but for the price, I’m going for the KeyRinger. Thank you so much for this info. There’s so many bad reviews out there for these types of products, or they simply don’t fit my situation. Can you tell us your experience with KeyRinger? Looks like the one I prefer as well, but I plan to buy multiples, so before I shell out the bucks…. Thanks again. I’ll share my experiences with whatever brand I choose. Clear Blue Dei | Geek out with Unique and Fun Holiday Gift Ideas! I have had very good experience with the KeyRinger and am getting ready to buy another set to go with my originals. I put one on my father’s remote in the nursing home and could easily find it when it got misplaced. But fairly shortly after I put it on his remote, that keyringer quit working. I thought the batteries must have died so I just put both away until a couple of weeks ago. I got new batteries from the drugstore and opened dad’s up to replace them and found that one of the batteries was missing. I guess someone took it out at the nursing home so of course it didn’t work. I put new batteries in and it is fine. I replaced the other batteries too, it was working but the sound was a little weaker and I had extra batteries so I figured why not. It has performed well so far and we are going to Thailand in February so I plan to attach them to our luggage and see how that idea works.